Almost every consumer drone on the market these days integrates the user’s smartphone do stand in as the live monitor. This is a move that makes sense in many different ways. For one thing, it allows drone makers to sell their product for less money. It also makes it easier to keep the software updated through the app store. There are plenty of situations where one would rather have a solution that was completely self-contained. Some professional drones are shared between multiple users and managing several people who have to install the app and keep it up to date can be a real pain. Apart from that, having the screen built in means the manufacturer has control over its specifications. That means they can decide what the resolution, sunlight readability and power consumption the screen should have. In short, despite the additional cost integrated screens tend to provide a more seamless user experience with a more refined execution. That’s not to say all drones that use this setup are equal! Let’s have a look at some popular choices for drones with screen on remote and see where their strengths and weaknesses lie. While Yuneec is technically the underdog compared to DJI, you’d hardly know it when looking at their products. Yuneec has done its fair share of innovation in the drone space and the Typhoon H is a great example of this. 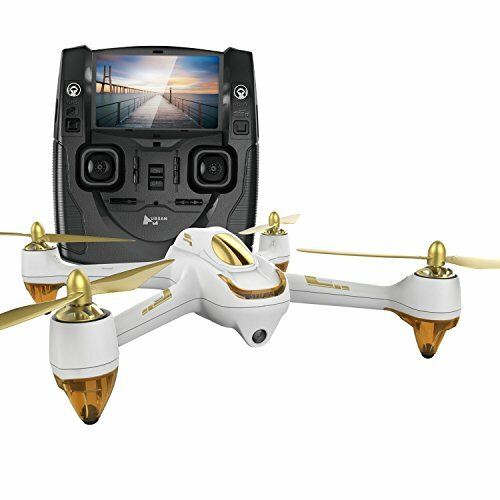 Yuneec were not playing around when they released the Typhoon H to market back in 2016. Even better, the going price has come down quite a bit since then, which means this might actually be the best time to take the plunge on the H.
The entire schtick of the Typhoon H is to provide professional performance, features and specifications, but at a price point non-professionals won’t choke on. Of course, we’ve heard that particular spin many times before. The truth is that if a relatively cheap consumer drone really could do what the pros need then there would be no “pro” drones as we know them today. That said, Yuneec have taken this particular challenge rather seriously. This hexacopter has a rated flight endurance of 25 minutes while carrying their CGO3+ 4K UHD camera. Since its release Yuneec have also been upgrading the abilities of their drone via software improvements. The flight stability is even better than it was at launch and it can now do new camera-related things such as panoramic photos, time-lapse recordings and serial photography options. New signal redundancies have also been added to make it more bulletproof in the field. All just by installing an over-the-air update. To bolster its “pro” credential even more, you can swap out the camera for other modules, including one for low light and thermal vision. While the Typhoon is an amazing drone in its own right, the real star of the show for our purposes is the ST16 Ground Station. It’s actually a dedicated, full-blown Android device. It has a gigantic 7-inch screen, beautiful controls and more functionality than you can shake a stick at. You can program flight paths right from the touch screen. Best of all, if you buy a second ST16 one person can control the camera while the other pilots. The very definition of a professional setup. These days it seems people only care about the Mavics, Sparks and Inspires when it comes to DJI. Yet it was the original Phantom that started it all. The latest incarnation of the line still looks the same at first glance. If you put the original Phantom next to the Phantom 4 Advanced however you’ll immediately see that DJI have actually done a lot to update and refine their first attempt over the years. Despite this some people might feel the Phantom’s design is still a little old-fashioned, but it’s hard to argue with what’s under the hood. With a 30-minute flight time and a 60 fps 4K camera and 20 megapixel camera sensor the Phantom aims a serious punch at more expensive options on the market. While other models in the DJI catalogue are probably better known for it, the Phantom 4 also boast advanced flight autonomy with a 5-sensor vision system. It can basically fly itself and won’t crash into anything even if you aren’t paying attention. It’s a complete package for most serious drone enthusiasts built on a proven design. What more could you want? The Phantom 4 Advanced comes with a rather odd, yet very cool controller. When you first see it, it might seem like there’s a smartphone connected to it externally, but actually the little screen held on an arm is part of the actual controller. It’s a 5.5 inch unit with a 1080p resolution. More importantly, it’s rated at twice the maximum brightness of the average smartphone. Not an issue when you can hook it up to a beefy battery inside the controller case. You don’t have to worry about learning an entirely new application either. The DJI Go app is built in to the controller out of the box. You can still livestream, edit, share and do all the other things you would usually do. This is the same compact and efficient controller design we’ve come to expect from DJI and the modern white and silver design actually outshines the drone itself. Hubsan isn’t quite what I would consider a “big” name in the drone world at the moment, but the company has made a name for itself with its popular X4 series of mini-drones. This H501S X4 model is larger than the first X4s to come out. It has a diagonal span of 220mm. This is an affordable FPV drone with a fixed 1080p camera. Gimbals and image stabilization have no place here. As you can probably tell this is not a drone that’s meant to render usable footage. This is about the joy of manual flight. It’s just you and the thumbsticks. Nonetheless, you can add an SD card onboard in order to have evidence of your sick flying skills. Total rated flight endurance is 20 minutes , but if you are going to push the sticks like a madman then you can expect things to go a little more slowly. While the X4 itself is a pretty simple and straightforward drone, Hubsan have gone all out on the controller itself. It’s quite a porker that requires no fewer than eight AA batteries. Personally I think a remote with a bit of heft makes for a better experience, but your opinion might differ. The X4 has a GPS mode with the ability come home by itself. Both of these features are operated by switches on the radio control itself. The included controller has an LCD screen built into it front and center. At 4.3” it’s not the biggest or highest resolution screen ever, but since this is not a photography drone you don’t need the extra real estate for hud elements. It is a good idea to use a sunshade through, since you do need to see where you are going and flight intelligence is pretty limited in comparison to a modern photography drone. Using this controller the effective range of the drone is somewhere between 500 meters and 800 meters, depending on conditions. There’s not that much point in talking about the drone itself when it comes to this particular package. It’s still exactly the same H501S I just mentioned above, but with some minor changes to give it that “Pro” flavour. On the drone itself the biggest change is that Hubsan have replaced their standard FPV transmitter with an upgraded 5.8Ghz model. This substantially improves the range of control and video transmission. You can now expect ranges as far as 1.8 km. The controller itself is totally different from the standard edition of this drone. You’ll notice the big dedicated video antenna immediately, but overall it’s more compact and a bit sleeker. This does however come at the cost of screen size. The 4.3” model on the standard edition is already a little small and here it’s shrunk down to 3.7”. With the sun visor deployed it should still do just fine though. Despite its smaller size, the screen on the advanced controller is actually a 1080p unit, whereas the standard edition controller has a 480×272 pixel screen. Also, here you have the choice of either using 8 AA batteries or a lipo battery. A bit more convenient and less expensive in the long run. Just looking at the product photos of the UPair drone you can almost hear the furious typing of a hundred DJI lawyers as they prepare to fire off a barrage of cease-and-desist emails. Well, that’s what you’d think. There’s no shortage of drones out there that blatantly ape the designs of popular DJI products and it doesn’t seem like much can be done about it. The main thing that worries me about this is that some makers are just trying to fool people into buying something they know very little about for a “bargain” price. You see this with cars too. I personally know one particularly dim witted person who is convinced that a Chinese Toyota knockoff is actually identical under the hood and that the rest of us are stupid for paying “full price”. That does not mean that every drone that copies the exterior appearance of a better-known, high end product is junk. UPair seems to be one of the rare companies who do hew a little too close to the competitions designs, but also actually care a bit about the actual product they produce. So what are you giving up compared to a real DJI Phantom in return for a hugely-reduced price tag? Well, it only musters 18 minutes of flight time for one thing. The range is also pretty short at a maximum claimed distance of 800m for flight and 500m for video. It’s not built from materials that are a comparable quality if you listen to customer feedback, but it is OK compared to other drones that cost the same. It’s not that the quality is bad by itself, it’s just nowhere near the drone it resembles, which is to be expected. You can also forget about the sort of intelligent flight systems that DJI have, because that’s where a lot of the money goes. Here’s some more deja vu. The controller on the Upair is a dead ringer for the one that comes with the Phantom. You get a rather humongous 7” LCD attached by an arm. It’s certainly going to be more comfortable than the average smartphone screen at 5” to 5.5” in size. While integrated video solutions might not be for everyone, it’s great that there are plenty of quality choices on the market at almost every budget level. These are by far not the only drones worth looking at, but it’s a great start to find the one that’s perfect for you. it’s better because I’m not going to buy a phone just so I can use it…. have the screen there without a phone lets me swap users easier.